Happy Cinco de Mayo and happy birthday to my papa!!! I love you love you love you! In honor of Cinco de Mayo, I have a an Italian pizza recipe for you. Hahahaha. Kidding obviously that isn’t very Cinco de Mayo–y. 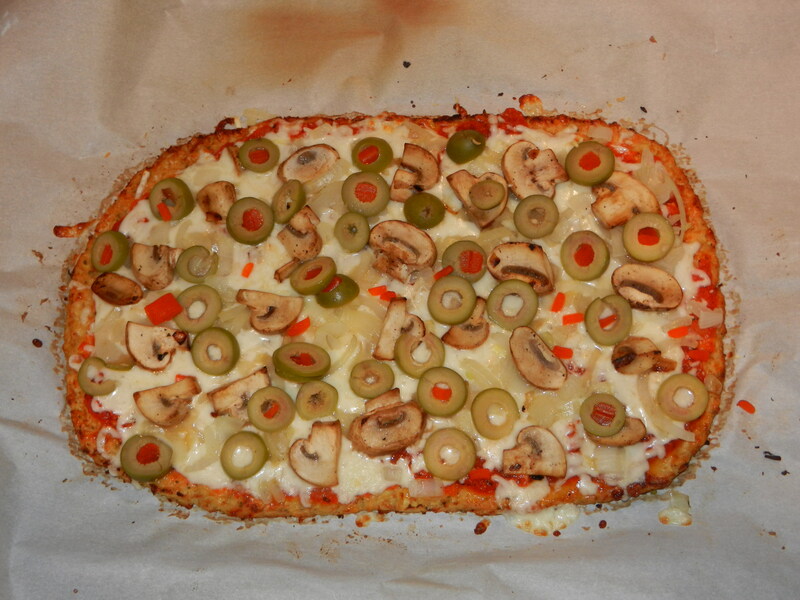 On Friday I made a gluten-free pizza that turned out pretty darn well. There are some changes I would absolutely make to it to make it better next time, and I am going to offer you those suggestions today. With that, you will have to experiment with baking times. The crust was just a little too thick for my liking, so what I would do next time is halve the recipe and make a thinner crust. This would account for less cooking time. I used an all-purpose gluten-free flour for the crust. I found this humungous bag at Costco. It’s made up of rice flour, ground flaxseed, quinoa flour, buckwheat flour, amaranth flour, tapioca flour, arrowroot flour, and xantham gum. 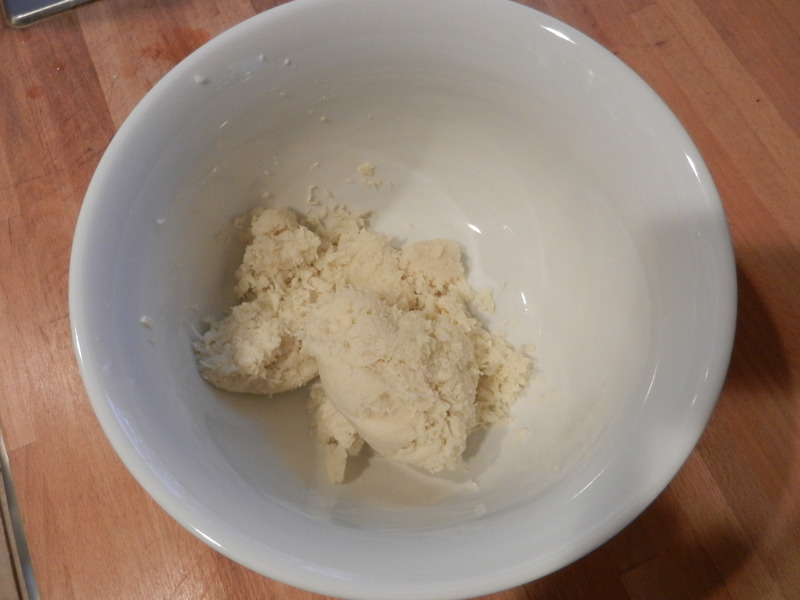 I’ve also used just plain old almond flour or almond meal in pizza crusts and they turn out great. What made me really excited about this pizza was that I could actually pick the piece of pizza up with my hand without having it fall apart. 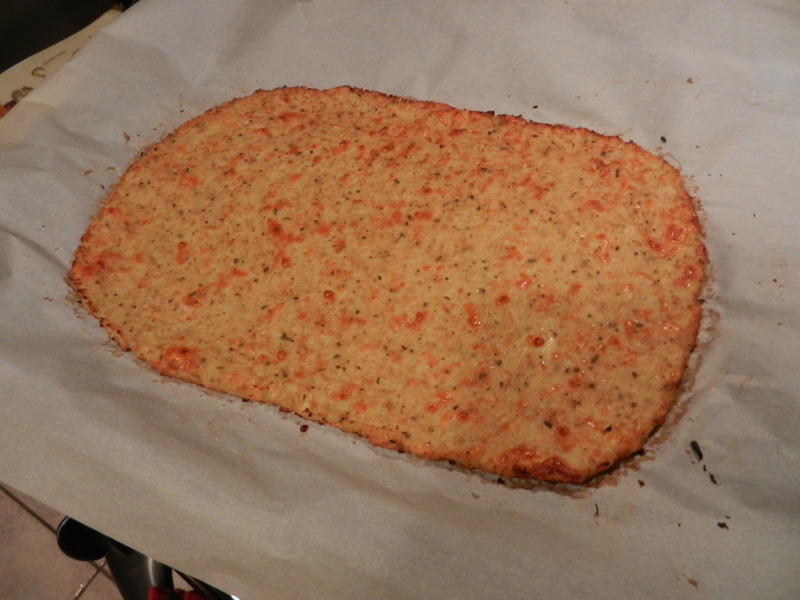 Most of my other gluten-free pizza crust attempts involve a fork because the pieces aren’t strong enough to pick up. I considered this a success for sure and I think that even if I made the crust much thinner, it would still hold up. What I did and what I think you should try versions. 1. What I did (the crust was thicker than I would have liked and not as crispy as I like). Preheat oven to 425ºF. Grab a large baking pan and either coat it with non-stick cooking spray or use a non-stick baking mat. Mix together all ingredients and place dough onto baking mat on the counter (not inside of the pan at this point). Cover the top of the dough with a piece of parchment paper. 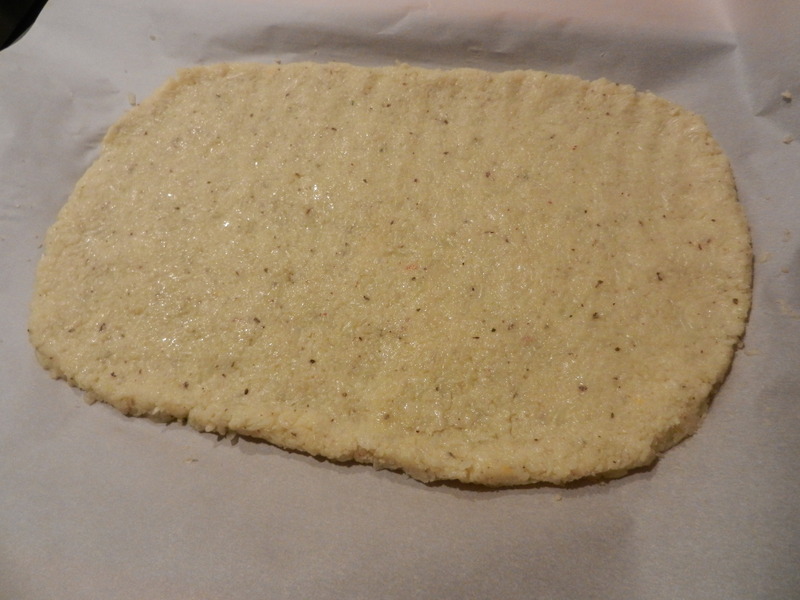 Use a rolling-pin to roll out the dough as flat as possible so that it still fits on the mat. Then, place mat onto baking pan. If you don’t have a mat you could do this by placing parchment paper on the bottom and the top of the dough and then transferring the dough to the pan once rolled. Remove crust from oven, use fork to poke holes in the crust but do not puncture all the way through. Add toppings as you wish. I added marinara sauce, cheese, and loads of veggies. Place back in oven and bake for 25 more minutes or until cheese is melted and toppings looked cooked. What I think you should do especially if you like thinner crust…. So much for a super guided recipe, right? Think of it as a fun experiment! 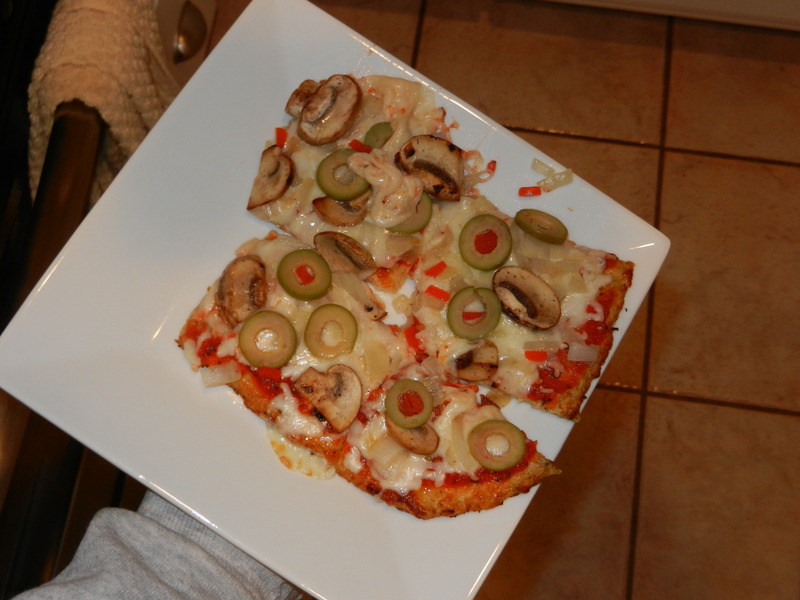 If you enjoy a thicker, not so crispy crust, you would probably enjoy the recipe I provided. But personally, I enjoy thinner and crispier! 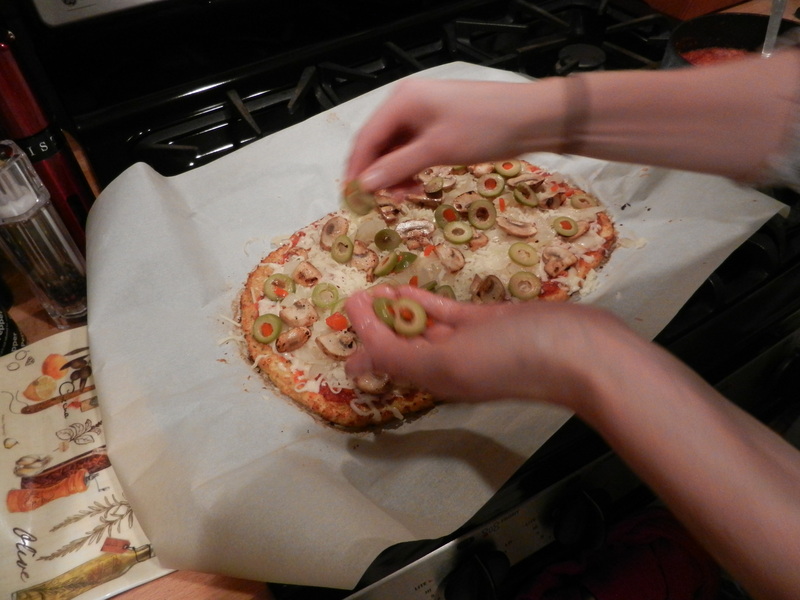 So a while back, Dana and I attempted making a gluten-free pizza crust. We struggled with finding the right time and temperature in baking the crust, and also failed to put parchment paper under the crust which resulted in a very stick-to-the-pan crust. It still tasted good, but I didn’t have a recipe to share considering it was a partial flop. We learned from our last trial, and on Monday night gave it a second shot and have succeeded in our attempt. It’s a little time-consuming but so completely worth it especially if you are a pizza lover who can’t tolerate gluten or if wanting to watch the waistline. Step 1: Preheat oven to 400° F. Rinse one large cauliflower head, cut off the stems, and toss them into a microwave safe bowl. Cover with plastic wrap and microwave for 10 minutes, or until cauliflower is fork-tender. Let cool slightly so that it is comfortable to handle. 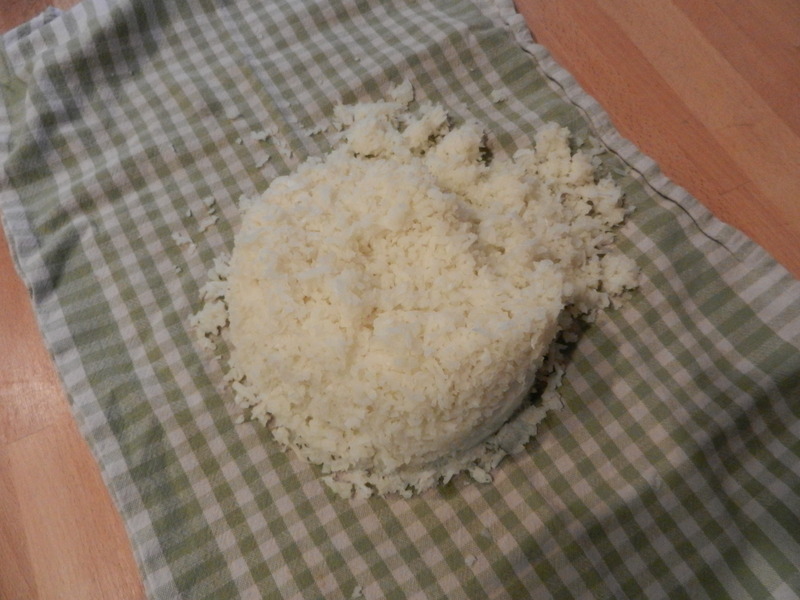 Place in food processor and process until you reach rice sized pieces. Step 2: In a thin kitchen towel place cauliflower in center and fold up all edges to meet in the middle in a big clump. Over the sink, gather the edges and twist together so that the liquid drains out of the cauliflower (try to keep your hands away from the hot liquid). Continue twisting until liquid is removed. Open towel. Step 3: Place cauliflower back into bowl. Make sure that it is slightly cool at this point. Add one egg, 1/2 teaspoon dried oregano, 1/4 teaspoon garlic powder, and 1/2 shredded mozzarella cheese. Stir to combine. Step 4: Line a baking pan with parchment paper (**important step**) and use fingers to flatten cauliflower into a thin crust. I flattened mine to about 1/2 inch thickness. Spray lightly with cooking spray or olive oil. Step 5: Place on the middle rack in preheated oven and bake for 50 minutes. Then turn the broiler on and broil for 5 minutes until top of crust begins to crisp up and turn golden color. Remove from oven. Step 6: Add tomato sauce, shredded cheese, parmesan cheese, and toppings. Place back into oven and broil on low for 4 minutes or until cheese is melted. Preheat oven to 400° F. Rinse one large cauliflower head, cut off the stems, and toss them into a microwave safe bowl. Cover with plastic wrap and microwave for 10 minutes, or until cauliflower is fork-tender. Let cool slightly so that it is comfortable to handle. In a thin kitchen towel place cauliflower in center and fold up all edges to meet in the middle in a big clump. Over the sink, gather and twist the edges together so that the liquid drains out of the cauliflower (try to keep your hands away from the hot liquid). Continue twisting until liquid is removed. Open towel. Place cauliflower back into bowl. Make sure that mixture is slightly cool. Add one egg, ½ teaspoon dried oregano, ¼ teaspoon garlic powder, and ½ shredded mozzarella cheese. Stir to combine. Line a baking pan with parchment paper and use fingers to flatten cauliflower into a thin crust. I flattened mine to about ½ inch thickness. Spray lightly with cooking spray or olive oil. Place on the middle rack in preheated oven and bake for 50 minutes. Then turn the broiler on and broil for 5 minutes until top of crust begins to crisp up and turn golden color. Remove from oven. Add tomato sauce, shredded cheese, parmesan cheese, and toppings. Place back into oven and broil on low for 4 minutes or until cheese is melted. Cut into squares and enjoy! Dana and I have been following our 10k training plan and have been lucky so far with the weather. Yesterday we bundled up and took Moose out for a 3 mile run around the neighborhood. I wore a tank top, two long-sleeve wicking shirts, pants, normal socks, light gloves, and ear warmers. The run was still pretty chilling given my layers but not painful at all. It was around 32°F when we went. Unfortunately, I think the cold-cold weather has finally arrived. This morning the thermometer says 16. I foresee adding on more layers in my next run. 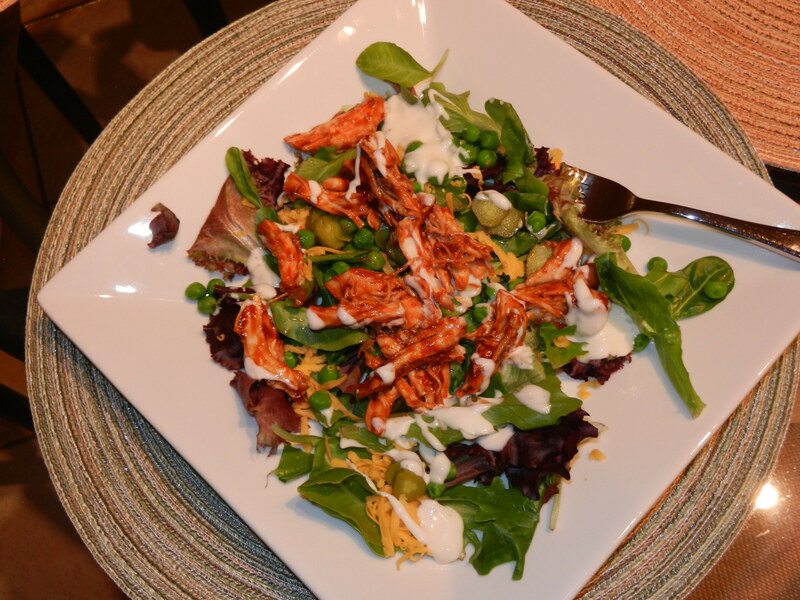 My motivational level on a scale of 1-10 last night for making dinner was a 3, so I went the easy route and threw together a BBQ chicken salad. There were slim pickins’ on salad toppings that actually went with the chicken so I went with dill pickles, peas, cheddar cheese, and ranch dressing. Random, but good. Speaking of random. Anyone else been watching Elf every time it’s on? “The only way to spread the cheer is by singing loud for all to hear.” I had that saying all day in my head at work yesterday. I am loving all of the Christmas movies! That is all for today….I hope you all have a fantastic Wednesday and are enjoying the holidays! Question of the day: What is/are your favorite Holiday movie(s)? My favorites are: Elf, White Christmas, It’s a Wonderful Life, The Holiday, and Home Alone (to name a few).